England achieved something David Beckham’s generation never managed: It reached the semifinals of the World Cup. 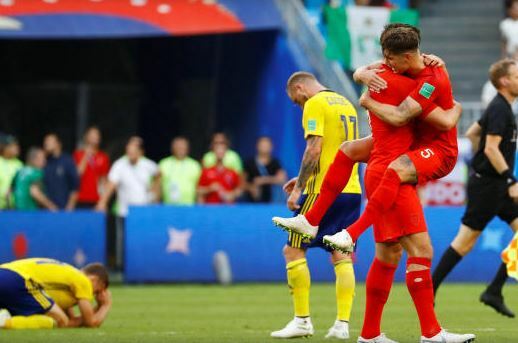 Harry Maguire and Dele Alli scored with headers in a 2-0 win over Sweden on Saturday, earning England a match against either Croatia or host nation Russia for a place in the final. Alli added the second goal by meeting a far-post cross from Jesse Lingard with a powerful header in the 59th, becoming – at 22 – the second-youngest scorer for England at a World Cup. It proved to be a match too far for the Swedes, who got further at a World Cup then they ever did with Zlatan Ibrahimovic – the team’s star for more than a decade – by being compact and hard to break down. That helped them win a two-leg playoff against Italy to get to the World Cup, top a group containing Germany, and then beat Switzerland in the round of 16. Sterling’s movement was very good, though, causing Sweden’s slow defense problems throughout.